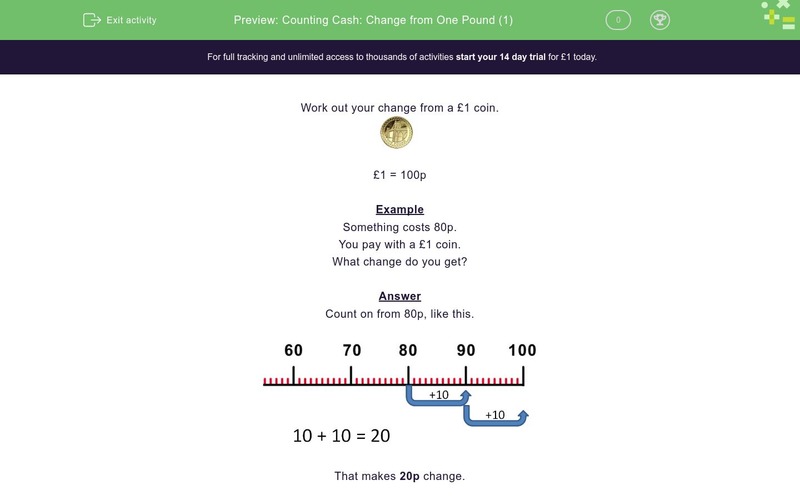 In this worksheet, students calculate the change from a £1 coin for each of the given amounts. Work out your change from a £1 coin. What change do you get? Count on from 80p, like this. How much change do you get? You pay for something with a £1 coin. You pay for it with a £1 coin. What change will you get? Count up from 50p to £1. So your change is 50p. Remember to write a p after the number. Count in tens from 80p to £1. Remember: write a p after the number. Remember to write the p after the number! Count up in tens from 90p to £1 (or 100p). So you get 10p change. Remember to write p after the number. Count from 10p to £1 (or 100p). So your change is 90p. Count in tens from 30p to £1. 7 tens = 70p. Your change is 70p. Count in tens from 60p to £1 (or 100p). Count from 99 to 100. You only have to count 1. So your change is 1p. Count up to 100p (or £1).